In preparation for St Patricks’ day. It was blustery weather for both RIDE setups and police made contact with 321 drivers. One Criminal Code charge was laid against a 30 year old Northern Bruce Peninsula man for having within two hours of ceasing to operate a Conveyance, being impaired with a BAC of over 80mgs. During the RIDE operation, one other driver was charged with an offence under the Liquor License Act. On Friday March 15, 2019 officers laid a ticket under the noise by law to the same resident of Countess St N that was issued a ticket the previous Friday night. With the warmer weather arriving, please be cognizant that neighbors will often sleep with windows open and noise levels should be kept to a respectable volume. On March 18, 2019 officers responded after a concerned person reported seeing an open door, lights on and hearing voices in a closed business on Concession 8 NDR. Officers responded promptly and were able to note the point of entry and an open man door. A search of the building showed that no one was inside and nothing was missing. Anyone with information is asked to contact the West Grey Police Service at 519-371-6911 or to contact Crime Stoppers at 1-800-222-8477. 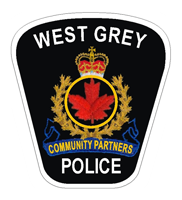 On March 22, 2019 West Grey Police officers executed an outstanding warrant from 2016. A 46 year old male with no fixed address was arrested and later released on an Undertaking. The man was charged with Uttering threats to Cause Death or Bodily Harm and will appear at the Walkerton courthouse in April. On March 22, 2019 an honest resident turned an expensive cellphone into police after he located it lying in the snow near the downtown core. Through the powers of social media, the owner was located and the phone was returned. A huge thank you to the citizen who turned in the telephone.